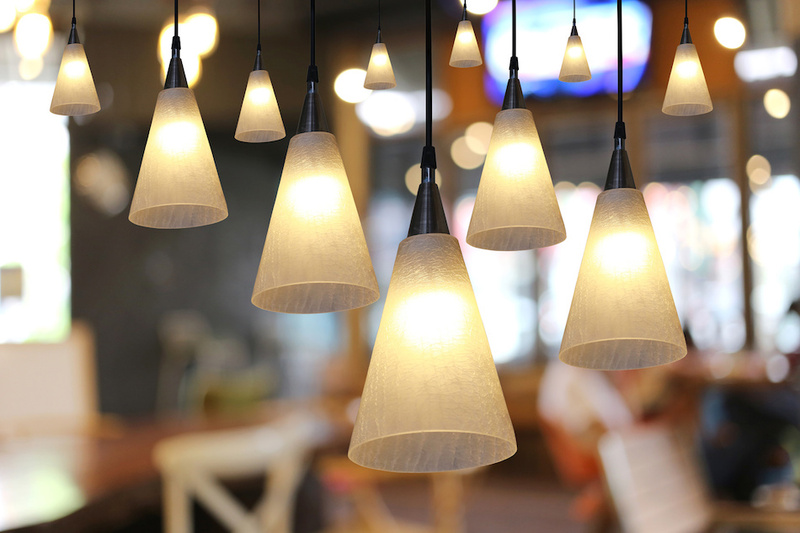 Whether a homeowner is trying to sell a home or simply trying to create a more pleasant environment to live, updating the lighting can have a very big impact on the appearance and functionality of the interior space. These lighting suggestions can help a homeowner who is trying to improve the appearance of their home. The kitchen is a part of the home where people need a variety of lighting conditions. For example, someone preparing food at the counter can benefit from task lighting, whereas someone cutting vegetables at the table might prefer lighting from all angles to prevent shadows. Providing a variety of light sources including overhead lighting, task lighting and pendant lighting can help prevent accidents like burns, cuts, slips and falls. Like the kitchen, the bathroom should come with a variety of different lighting types in order to reduce the chance of accidents. The bathroom is a place where people commonly slip and fall. Lighting can help people see the hazards in the bathroom to prevent these slips and falls from taking place. Recessed lighting over the shower and toilet is especially important because these are two areas where accidents commonly occur. In addition, pendant lighting over the vanity and mirror make it easier for the bathroom user to arrange hair, put on makeup and examine themselves in the mirror. Mood lighting is more important in the dining room than in any room of the house. There are many ways for homeowners to provide mood lighting that can create intimate and enjoyable dining experiences. Ambient natural lighting makes daytime meals attractive and enjoyable. To ensure that the room has adequate natural lighting, remove dark curtains that block light from entering the room. A homeowner may replace dark curtains with sheers or light cotton curtains to allow more natural daylight into the room. In addition to natural lighting, the dining room benefits from attractive pendant or chandelier lighting. Many homeowners think of chandeliers as being traditional and conservative, but there are many modern versions of the chandelier that fit well in contemporary-style homes. Track lighting, recessed lighting and table lamps are all common forms of lighting in living room spaces. The living room is also an important room for natural, ambient lighting, because many homeowners spend happy daytime hours in their living room. Like in the dining room, it's helpful to remove dark curtains that block the light. Lamp lighting makes the living room a comfortable, cozy space to curl up with a book or watch television, while track lighting is used to highlight art on the walls. Homeowners who install a variety of lighting types in the living room are best able to find lighting for all occasions. The bedroom can be improved with a range of different lighting options, but most of all, small lamps. Small lamps give the bedroom a cozy, pleasant appearance and give homeowners the ability to control the amount of light in the bedroom. When more light is desired, more lamps can be turned on. The best way to ensure that a Kentwood home looks good in various types of lighting is to work with a knowledgeable professional. He or she can help the homeowner determine what types of lighting looks best in each room and fits that homeowner's lifestyle.